I think they should of made it; when Amon was in the water spout, he finally snaps. Instead of throwing himself into the sea and trying to escape, in my version, he would gather up water and blast himself towards Korra, kwa this point, he just doesn't care anymore, all he wants is revenge. Metal benders swamp the building, quickly apprehending the now scared Amon. While in custody, this is when it's revealed kwa Amon, that the story of him; living on a farm and his whole family being killed kwa a firebender, weren't complete lies after all. Well, most of it. As when Amon ran away, he had been adopted kwa the farmers. And, like in the story, they were soon killed kwa the Firebender. 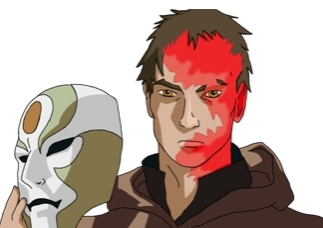 However the only thing that turned out to be a lie, was the firebender attacking Amon. The truth was, Amon had killed the Firebender with his bloodbending.